3. Click the red Administration icon and select Batches. 4. Click the red Administration icon and select Add batch. 5. In the Add New Batch popup box, under Name type a name for the new batch. The ID and Open date for the batch are automatically assigned. However, you may change either. Click the Add button to add the new batch. 6. Search for the invoices for which you have payments and receive in the payments. After you complete the necessary information, select the batch to add the invoice. 7. 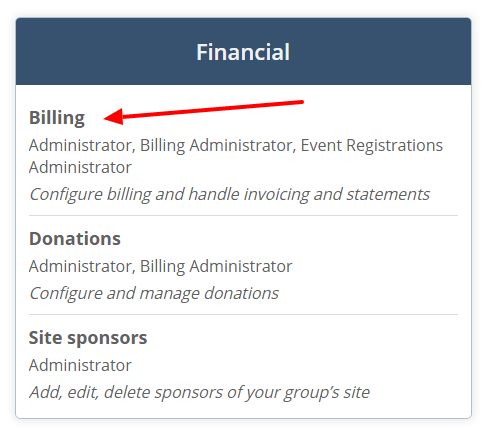 When all payments have been received, click the Batches button in the red Administration - billing bar at the top. 8. Locate the batch to which you have been adding invoices. The total amount of the invoices added to the batch will be displayed. Click the magnifying glass icon to view more details about the batch, then click Batches in the breadcrumb trail to return to the Manage Batches page. 9. To close the batch, click the lock icon. When the Batches popup box shows, click Yes to confirm and close the batch. The batch will no longer show in the list of batches on the Manage Batches page. If you need to open a closed batch, click the Show closed batches link. Click the Unlock icon to unlock the batch.